This Phoenix Arms model HP22 is a self-loading, blowback operated, semi-automatic pistol that is chambered for the .22 long rifle cartridge. This pistol has a bluish black finish with a vented rib barrel and an external hammer. The frame and slide are die cast zinc alloy, while steel is used in the barrel, slide core, magazine and all working parts except the trigger. The Patridge type sights include a blade front sight that is mounted on the top of the vented barrel rib and a rear sight that is adjustable for windage only. The HP22 is fed by a single column 11 round detachable box magazine. On the left side of the pistol is a push button magazine release, a thumb safety located above the grip and a firing pin block lever located on the slide next to the rear sight. This pistol came from the factory with a 3 inch barrel utilizing 16 grooves and a right hand twist with a fast one turn in 8 inches. The pistol has a total length of 5.6 inches and an unloaded weight of 20.5 ounces. This firearm does not incorporate any type of slide hold open mechanism to inform the operator that the last round has been fired. Although the safety lever can be pushed upward when the slide is at its rearward most position thus locking the slide open for general cleaning. The checkered grip panels are black in color and are made from plastic. The pistol has a trigger pull of right at 5 1/2 pounds. 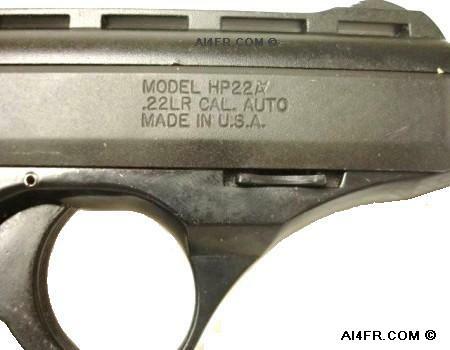 The Phoenix Arms model HP22 pistol has been in production since 1994. 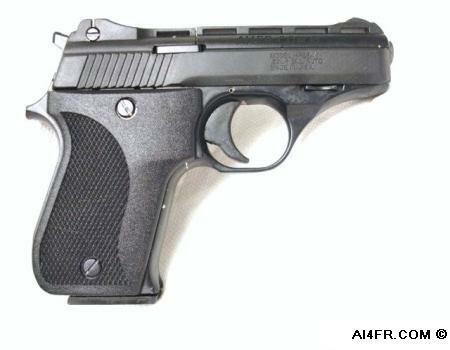 I recall reading the advertisements for this little pistol with a retail price of just under $100. The first one I purchased was in October of 1994 and is featured here. This pistol is their blued model and was purchased by itself and not as the "Deluxe Rangemaster Target Kit"package. I have had to send this pistol in for repair on two different occasions. Each time the only out of pocket expense was in shipping the pistol back to Phoenix Arms. Even after owning the pistol for well over a decade, the Phoenix Arms company stood by their lifetime warranty and made the repairs and shipped back the pistol with no bills attached. Remember, this pistol was purchased for less then $100 excluding tax and over 14 years ago. When the pistol was returned, it worked great but both the slide and the barrel were new replacements and had a more parkerized finish instead of the nice bluish black finish that were on the original parts. This finish does not match that of the receiver. These parts were fine and still like new and were not the cause of the problem that prompted the return. The pistol was returned due to a broken magazine release button and Phoenix gave no explanation for the major parts swapping. See the two pictures below at the bottom of the page to view the original parts. A brief history of the Phoenix Arms Company. The Phoenix Arms company has been in operation since 1992. They got their name from the Raven Arms company, which went out of business after they were unable to recover from a fire in November of 1991. George Jennings who started the Raven Arms company in 1970 decided to retire after that 1991 fire that destroyed the plant. Phoenix Arms is considered to have risen from the ashes of Raven when they purchased the tooling and the rights to Raven's pistol designs. The partial owner of Phoenix Arms, Dave Brazeau, was also the former general manager of Raven Arms. The company has 20 employees with annual sales of 1.2 million U.S. dollars. The company was located at 1420 South Archibald Ave., Ontario, CA 91761 but have since moved to 4231 E. Brickell St, Ontario, CA 91761. Their current contact telephone number is 1-909-937-6900. The company manufactures two different calibers of single action, semi-auto pistols. Their product line includes the model HP which is chambered for either .25 ACP(Automatic Colt Pistol) or .22 LR and come in a 3" or 5" barrel lengths with either a nickle or blue finish. The firearms can be purchased alone or in the Deluxe Rangemaster Target Kit as featured on this page. The HP pistols are a different design then those manufactured by Raven. The recoil spring on the HP22 is under the barrel instead of around it and the slide on the HP22 also differs in that it does not enclose the barrel as seen on the Raven and Jennings pistols. 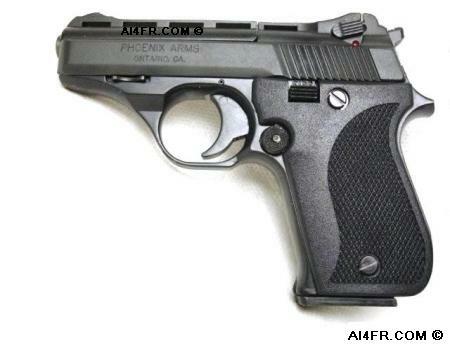 The Phoenix Arms company manufactures affordable firearms for working class Americans with a 100% lifetime warranty. The rights of American citizens are not just for those that can afford it, but rather every American citizen, and these little pistols fill the bill nicely. The product line of the Phoenix Arms company brings affordable and dependable firearm protection into the reach of every day average Americans. 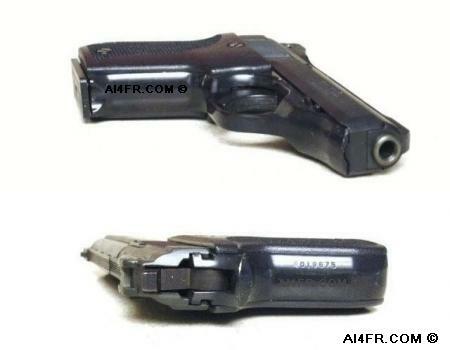 The photograph on the left is of the front and back of the Phoenix Arms model HP22, while the picture on the right shows the top and bottom of the pistol. Underneath the left grip there are two inscriptions that have been molded into the receiver. 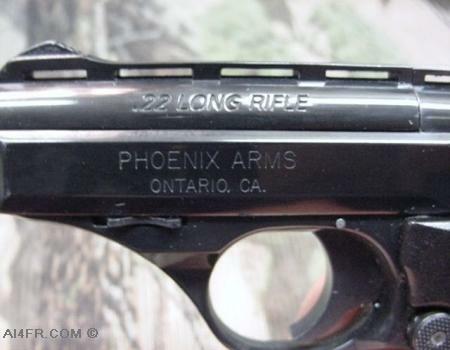 The first one is as follows, "PHOENIX ARMS MODEL HP 22/25 CAL ONTARIO, CA.". The second mold inscription states, "INT'L DIE CAST GARDENA, CA. U.S.A". The full serial number is located on the right side of the backstrap. The photograph on the left shows the slide markings that are found on the right side of this HP22 pistol. 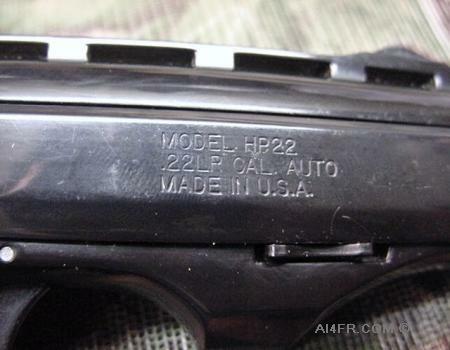 This inscription reads as follows, "MODEL HP22" and then underneath that is ".22LR CAL. AUTO" and then underneath that is "MADE IN U.S.A.". This inscription indicates that the model of this pistol is HP22, and that it is of the semi-automatic design and chambered for the .22 caliber long rifle cartridge. The bottom line of this stamp is a marking that sadly is not seen very often on many of the items that we use everyday. This stamp indicates that this pistol was manufactured in the United States of America. At the end of the top line next to HP22, there is a double stamping of the letter "A". Stamped right on top of the letter A is another letter A that has been stamped upside down. The photograph on the right is of the markings that are found on the left side of this pistol. The top line which has been stamped on the barrel is as follows, ".22 LONG RIFLE". This mark indicates that the pistol has been chambered for the .22 caliber long rifle cartridge. 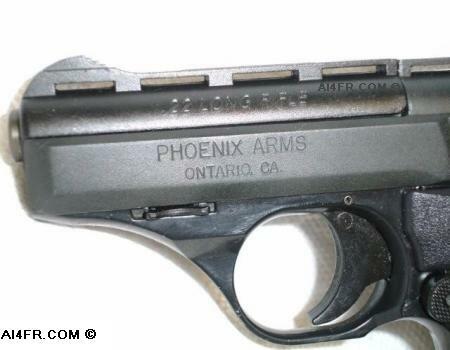 Underneath the barrel stamp, the slide has been marked with "PHOENIX ARMS" and then underneath that is "ONTARIO, CA.". This slide stamp identifies the manufacturer of the pistol as Phoenix Arms and lists their location as Ontario, California. These next two photographs are some old pictures that I had of the pistol before it was sent back to the factory for repair. These pictures show the blackish blue finish that is on the original slide and barrel. The finish is different on the new parts that Phoenix installed on the pistol when it was in their hands for repair. The finish on the new slide and barrel does not match that of the receiver. The slide and barrel were fine and still like new and were not the cause of the problem that prompted the return. 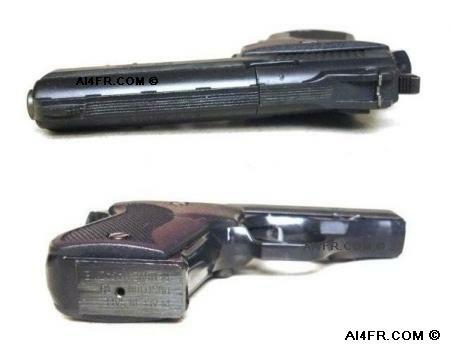 The pistol was returned due to a broken magazine release button and Phoenix gave no explanation for the parts swapping. The warranty from Phoenix Arms is quoted as follows, "For the life of the original owner whose warranty card is on file, Phoenix Arms will repair or replace, at its sole discretion, any or all original parts of this pistol that are defective, or that become unserviceable due to normal usage.". This pistol has numerous safety features that some shooters may consider to cumbersome. There is a slide mounted firing-pin safety that will allow the operator to safely lower the hammer on a chambered round. There is also an additional frame mounted safety above the grip that locks the trigger, and which must be engaged in order to remove the magazine. This means that you can not remove the magazine unless this safety is moved to the safe position. Once the magazine has been removed though, nothing will function. You must also consciously move the safety to the fire position before you can move the slide and chamber a round. Furthermore, you can not eject a live round from the chamber until you remove the magazine, unload it, reinstall it, and then move the safety to the fire position. What I am saying here is that if there is a round in the chamber and you have a fully loaded magazine inserted into the pistol and decide that you are done shooting for the day, you can not simply remove the magazine and then pull back on the slide to eject the live round as you would do on many other firearms. You will need to go through the procedure above in order to remove that round from the chamber.